Wicked GT Final Scenario now available! Prize support, Army Lists, and Time changes! The 5th and final scenario for the first ever Wicked GT is now available! After your long trek through the mysterious land of Oz it’s time to return home and get back to where it all started. Follow the link to see the final scenario! Wanted to share some news and notes as we get closer and closer to May 15th. There’s lots going on so I’ll share some bullet points and get straight to it! – Prize support! So far we’ve started to get tons of stuff in the mail that our awesome sponsors have helped us out with. We have lots of boxed sets and blister packs of all kinds of Games Workshop product ready to hand out for raffles, door prizes, and of course, the winners! 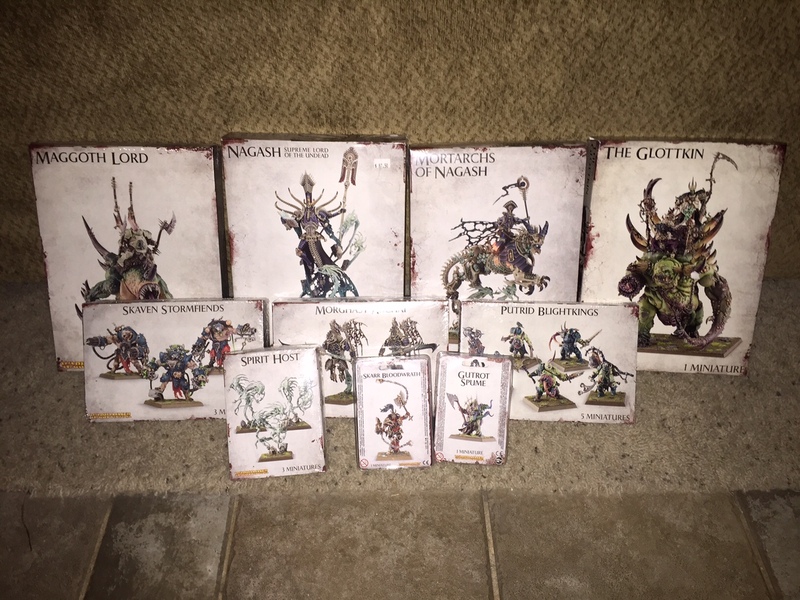 Some of the things we’ve received are an army battalion of Tomb Kings, Ogre Kingdom Leadbelchers boxed set, and even some various other models to help fill out your armies. Yesterday we received from our awesome sponsor out in California (Cardboard Arcade) a ton of End Times stuff! We know that all the books are now released and here’s your chance to get your hands on the models! Take a look at all of this stuff we’ll be handing out! – Another important thing to mention is the time allowance for each game. We’ve received multiple feedback concerning the length of each game for a 2,500 point WHFB battle. While some people can play pretty quickly and get the game done in a short amount of time, there’s still other people that may need that little bit extra to get it all done. To this end, we’ve decided to lengthen the amount of each round to 2 hours and 15 minutes. We had originally had it for 2 hour rounds but this will give you an extra 15 minutes to get your last hits in against your opponent and hopefully get those extra points you need to pull out the win! So, going forward, each round will be 2 hours and 15 minutes. (I’ve made the changes to the Schedule page). – I’ve received a number of army lists but I’m still short a few! If you still have not submitted your army list (you know who you are!) then please do so right away so that I can grade them for Swedish Comp. Remember that this score will only be used to determine your weight class. Get your lists in to thewickedgt@gmail.com! – Because of our rule to make all buildings impassable we have decided to ban ONE ITEM from this GT, and that is Fozzrik’s Folding Fortress. Please remember this when building your army list. – Best Western has informed me that the rates for staying there will be valid up until 2 weeks prior to the Wicked GT. So if you plan on staying at the hotel you have until about May 1 to get the special booking price. Don’t delay! – Beer! We are going to set up our own bar for the weekend. It will likely just be available on Saturday but we are going to have a keg of beer available that all participants will be able to drink from until it lasts. We’ll also have some simple drinks that our bartender will mix up for you as well. It’s all included with your entry fee to the Wicked GT, however, don’t forget that tips are always appreciated! – The Painting Rubric has been added to the website as well in case you wanted to look it over and see how you can score max points. You can find it by following this link. – The cost for the Wicked GT is $65 and you can pay via paypal by sending your payment to thewickedgt@gmail.com. – April 16, 2015: The last day for refunds has passed. If something comes up and you need to cancel from the Wicked GT we regret to inform that we can not give you a refund. The funds are now being spent in order to make final preparations for the tournament. Thank you for your understanding! – April 19, 2015: Army lists are due now!! Get them in!!! If you have to turn in your army list after April 19th then you will receive a -5 points to your overall score, to be applied at the end of the GT. Please do your best to get your lists in on time. I understand that things come up, you may want to change a unit or two, or even bring a new army entirely. I’ll work with you on this so that no negative points are applied. If you work with me then we should be fine… but if you’re blatantly not putting together a list and waiting until the last minute then it really leaves us no choice so do your best to get me a list as soon as you can!!! We just need to get army lists in as quick as possible so that we can grade them for Swedish Comp (which will be used ONLY to determine 1st round match-ups). There should be no reason anybody has to start the tournament down -5 points. – Golden Toto Painting Competition – Get your entries ready for the Golden Toto Painting Competition! The trophies have gone to print and they will be ready for the winners. In addition, the winners prize support has been provided by Bits of War so each winner will get product provided by http://www.kromlech.eu! Thank you to our great sponsor, Bits of War! – Player’s Packet: All the information for the Wicked GT can be found in this packet ranging from the sponsor list, schedule, venue information, all the way to the scoring rubrics for Appearance and Sportsmanship. This entry was posted in General Updates and tagged Bits of War, Cardboard Arcade, End Times, Grand Tournament, The Wicked GT, Warhammer Fantasy, Wicked GT. A note on your Army Lists and other news and notes! I wanted to address an item concerning your army lists. Apparently I’ve been telling people that the lists will be graded for Swedish Comp to determine 1st round match-ups… I’m not sure why I’ve been thinking that… Maybe I had it on my mind from another GT that I attended, my mind wandered way too far off, or something that I’m not even sure of. In any case, that is NOT the reason why we’re grading your army lists for Swedish Comp… The reason we are grading them is to determine your Weight Class. 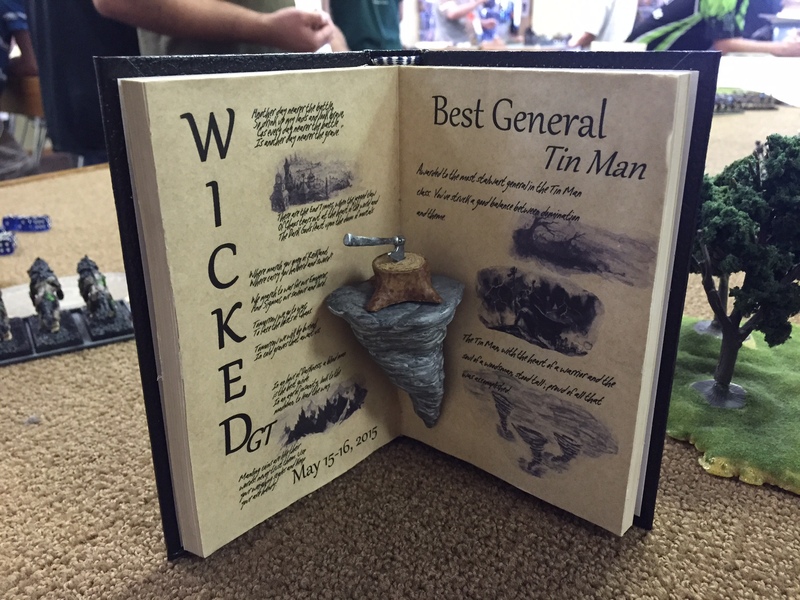 If you notice on the Scoring Page we are handing out Best General Awards for each of the Weight Classes (Wicked Witch, Tin Men, and Scarecrow). Your Weight Class category will be determined on where your army list ranks. Without going into too much detail it would work something like this: If your Swedish Comp is lower, say, a 6.3 then you would go into the Wicked Witch Category… If your score is upwards around 16 or so then you would go into the Scarecrows Category. At the end of the GT, we’ll score each of the armies in these categories and the person with the most Battle Points in each category will be determined to be the Best General of that category. Of course this all depends on the spread of the Swedish Comp with the army lists we receive. We won’t have 20 people in one category and then only 10 in another category. We’ll evenly distribute as much as the lists allow us. More details coming on that soon. Sorry for any confusion, I’m not sure what I was thinking… Let me know if you have any questions about this. – April 16, 2015: The last day for refunds has passed. Thank you to everybody that has paid and helped us to get the ball rolling on final preparations! – April 19, 2015 (2 DAYS FROM NOW!! ): Army lists are due on this day! If you have to turn in your army list after April 19th then you will receive a -5 points to your overall score, to be applied at the end of the GT. Please do your best to get your lists in on time. I understand that things come up, you may want to change a unit or two, or even bring a new army entirely. I’ll work with you on this so that no negative points are applied. If you work with me then we should be fine… but if you’re blatantly not putting together a list and waiting until the last minute then it really leaves us no choice so do your best to get me a list as soon as you can!!! We just need to get army lists in as quick as possible so that we can grade them for Swedish Comp (which will be used ONLY to determine 1st round match-ups). There should be no reason anybody has to start the tournament down -5 points. – Golden Toto Painting Competition – One note I wanted to add for the Golden Toto Painting Competition… If you plan on participating in the competition you can pay your entry fee the day of the Wicked GT rather than send a payment through paypal. It’s only $5 (or $10 if you have multiple entries) so this money can be paid at the actual GT. If you have any questions about this please let me know. Also, make sure to get your entries painted! Can’t wait to see what comes along down the yellow brick road! Wicked GT Scenario Four now available! We are only 1 Month Away! Scenario Four is now available for your viewing pleasure! Only one more scenario to go and it will be released within the next few days. We are getting very close to the first ever Wicked GT! – April 16, 2015 (TOMORROW! ): This is the last day for refunds. If something happens after this date we regret to inform that you can no longer receive a refund. This is because the money is likely already spent in order to shore things up prior to May 15th. – April 19, 2015 (4 DAYS FROM NOW!! ): Army lists are due on this day! If you have to turn in your army list after April 19th then you will receive a -5 points to your overall score, to be applied at the end of the GT. Please do your best to get your lists in on time. I understand that things come up, you may want to change a unit or two, or even bring a new army entirely. I’ll work with you on this so that no negative points are applied. If you work with me then we should be fine… but if you’re blatantly not putting together a list and waiting until the last minute then it really leaves us no choice so do your best to get me a list as soon as you can!!! We just need to get army lists in as quick as possible so that we can grade them for Swedish Comp (which will be used ONLY to determine 1st round match-ups). There should be no reason anybody has to start the tournament down -5 points. Wicked GT Scenario Three now available! Other News & Notes! Scenario Three is now available for your viewing pleasure! Follow the link to find out what the latest scenario is all about! Wanted to take a quick moment to let everybody know about some things that are coming up. Next week we will be one month away from the Wicked GT and there’s a few items that have popped up over the last few days. First, I wanted to address banned magic items from the Wicked GT. Because of our rule to make all buildings impassable we have decided to ban one item from this GT, and that is Fozzrik’s Folding Fortress. Please remember this when building your army list. Also, I spoke with the folks over at Best Western and they have informed me that the rates for staying there will be valid up until 2 weeks prior to the Wicked GT. So if you plan on staying at the hotel you have until about May 1 to get the special booking price. Don’t delay! Another important note that I wanted to share! Beer! I’ve worked with the Best Western and they are going to allow us to set up our own bar for the weekend. It will likely just be available on Saturday but we are going to have a keg of beer available that all participants will be able to drink from until it lasts. We’ll also have some simple drinks that our bartender will mix up for you as well. It’s all included with your entry fee to the Wicked GT, however, don’t forget that tips are always appreciated! The Painting Rubric has been added to the website as well in case you wanted to look it over and see how you can score max points. You can find it by following this link. Check the dates below to find out what’s coming up very soon! Don’t forget to hurry and sign up and get paid up so you can be included in what’s certain to be a great weekend! The cost for the Wicked GT is $65 and you can pay via paypal by sending your payment to thewickedgt@gmail.com. Lastly, here’s a link to the Player’s Packet. All the information for the Wicked GT can be found in this packet (sans scenarios) ranging from the sponsor list, schedule, venue information, all the way to the scoring rubrics for Appearance and Sportsmanship. Scenarios are being refined as we speak and should be posted within a few days as well so you can see what you’re getting yourself into! Please make sure to visit the registration page to send your payment out! Wicked GT Scenario Two now available! Golden Toto Painting Competition! Scenario Two is now available for your viewing pleasure! Follow the link below to view it and make sure to give us your feedback if you have any. The next 3 scenarios will be posted over the next few days along with some other important information that will be found in your player packets upon completion of you registration. Wicked GT Scenario One now available! Important dates fast approaching! – Golden Toto Painting Competition – Hopefully you’re either working on a new model to enter into the Golden Toto Painting Competition or you already have something you’d like to enter. Either way, make sure to participate as we have prize support for each of the winners in 4 categories provided by Bits of War! Each winner will also receive a trophy for their win as well. Make sure to visit the Golden Toto Painting Competition Info page to find out all the rules about participating. We’re looking forward to seeing some great paint jobs as I know the Midwest has tons of great painters located right here. Last Second Wicked Primer Results and Important Dates! Congratulations to all of the winners and a huge thank you to everybody that made it out and made the weekend a success. We have great momentum going right now and we’re carrying it into May as we are only about 2 months away from the first ever Wicked GT! Make sure to visit the Midwest Gaming Alliance blog for more information as well as pictures of the tournament. Here’s a WIP of the Best General Trophy that Chris McArthur is making for us. This one will be handed out along with 10 other trophies (not to mention the prize giveaways)! In addition to one-of-a-kind trophy you’ll also be getting lots of prize support and other things! Good luck to everybody! I know the Wicked GT is going to be great. The Best General Trophy that we’ll be handing out in May. Lastly, here’s a link to the Player’s Packet. All the information for the Wicked GT can be found in this packet (sans scenarios) ranging from the sponsor list, schedule, venue information, all the way to the scoring rubrics for Appearance and Sportsmanship. Scenarios are being refined as we speak and should be posted within a few days as well so you can see what you’re getting yourself into! Please make sure to visit the registration page to send your payment out! Remember, prices go up on Sunday, March 22nd so make sure to get paid up!